Watchfire Signs' awards program recognizes Watchfire dealer partners who showcase the capabilities of outdoor digital advertising. The third annual awards recognize on premise digital signs that display excellence in design, legibility of sign content and advertising effectiveness. Eden Resort in Lancaster, Penn., wanted a sign that would capture the essence of their property and allow them to advertise their many events and services. The experts at W.J. Stricker Signs, Inc., recommended a Watchfire display as part of a creatively designed and professionally fabricated one-of-a-kind digital sign. The workmanship and creative use of LED signage earned W.J. Stricker Signs, Inc. of New Oxford, Penn., the Grand Prize in the 2017 Watchfire LED Sign Awards. Watchfire Signs established the awards program in 2014 to recognize Watchfire dealer partners who best showcase the capabilities of outdoor digital advertising. The third annual awards recognize on premise signs installed in 2016 that display excellence in design, legibility of digital messages and advertising effectiveness. 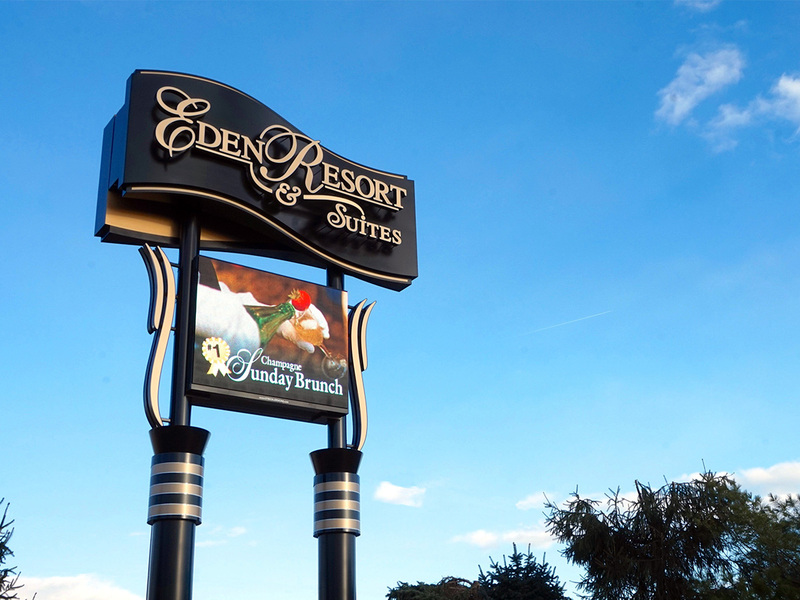 The Eden Resort sign used a Watchfire 12mm, full color display sitting directly below an ID sign made of routed and beveled aluminum, all atop 40-foot-tall pylons. The ID sign’s channel letters on the face are internally illuminated with standoffs, and backlighting is done with LED light sticks. For a complete list of winners, visit: http://www.watchfiresigns.com/signawards.